Henderson's Relish Building, originally uploaded by electrolyte2006. 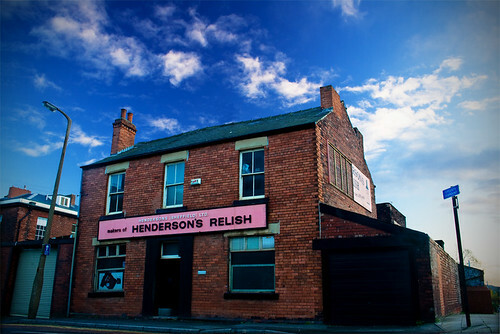 Those of you not from Sheffield will probably have no idea what Henderson's Relish is. Well, it is Sheffield's version of Worcestershire Sauce and many, me included, would say that it is much nicer than the Lea and Perrins version. It tastes great on cheese on toast and can turn the blandest of bland gravy into the most a gorgeous, meaty liquid. And folks around here are very proud of it as it has been made in Sheffield for over 100 years. I'd recommend you head over to the Henderson's Relish website and order some for yourself.